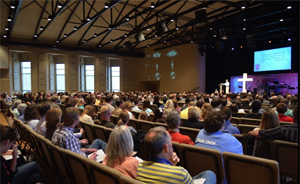 Project: The growth of the congregation at Fellowship Bible Church was making their old facilities feel cramped. I remember clearly the gridlock of people between services in the lobby of their old building. Oh my. 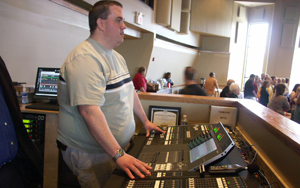 Led by then volunteer tech director Wyatt Johnston (he is now on staff as their more-than-full-time Tech Director), the church's building committee began to tour other churches in the region gathering ideas and considering who they would hire for their new building project. 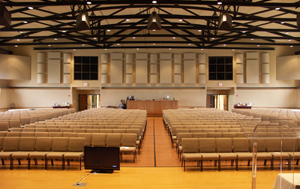 Fortunately for us, our project at FCC in nearby Salina caught their attention, and they ultimately hired us as their acoustics and AVL design consultants for the project. As with so many new construction projects, every group wants their own piece of the overall budget. I don't envy the person who has to make such decisions. We go into each project hoping and praying that the person we're working with understands the value of high quality AVL systems and the importance of properly dealing with room acoustics, mechanical noise and sound isolation. And for the most part our recommendations for the project were followed. (We won't talk about the fact that our recommendation for wall construction between the Youth Room and Main Sanctuary was originally not taken seriously by the building committee.) The project budget was very tight, with the sense that this room would serve as their worship space for the next few years until they could start on their dedicated sanctuary. Whenever I am faced with the need to throttle back the list of equipment for a project in order to fit within the church's budget realities, our guiding philosophy is to trim features, not quality. Features can be added later on, but you're not likely to replace the main loudspeakers anytime soon. 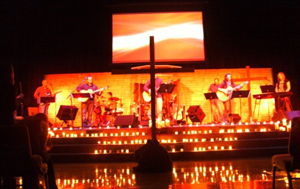 Their first service took place on December 2, 2007. On opening day, Wyatt had the basic AVL tools he needed to deliver a high quality presentation. The room itself sounds great, and beautifully supports their style of worship music. What impresses me the most is to see how Wyatt has over the past few years learned how to push those basic tools to their maximum performance. For example, he does more with 24-channels of dimming than most do with twice that. And while I'm sure he would have enjoyed starting out with more gear to work with, that didn't slow him down one bit. Having proved his talents to the church leadership, he has since been able to add some high impact tools for very little investment, aided by the fact that our design of the infrastructure for the initial construction allowed him to add those elements easily. Especially when we work with a new construction project, one of my goals as a designer is to think several years down the road and do my best to future-proof the AVL infrastructure. When the church pastor turns to the tech director and says "Hey, can we do such and so? ", I want the TD to be able to respond with a confident smile and say "Yes, sir, we can do that." That can only happen if the infrastructure is there from the start. Curved Back Wall - Reflection Problems Fixed!